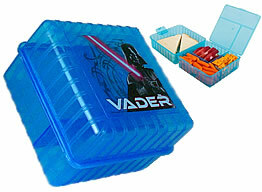 Plastic two compartment sandwich box/snack container with snap closure and snap close divider between the compartments. Two compartment design is great for separating your sandwich from your snacks or from your salad, dessert and condiments. Top compartment fits a typical sandwich. Bottom compartment includes 3 sections. A snap close cover on the bottom compartment separates the top and bottom compartments. Overall box is also snap open/close. Color/design: Outside as shown. Inside color is the same blue as the box outside color (not the color shown in the inset image). Fits inside a soft-sided lunchbox that is at least 3" deep. Bottom compartment: 5.375" long x 5.375" wide x 1.625" high.